Mystery Tribune is a cut above—unique, stylish, beautiful. The truth of that will be obvious even before you’ve peeled back the cover. Mystery Tribune is acclaimed for the quality of its writing, its international reach and its mix of established and emerging contributors. We distribute our premium print issues via museums and specialty bookstores and our digital issues are available on Amazon, iBooks, and Barnes & Noble as well as 40 other platforms ranging from Spain to Japan. 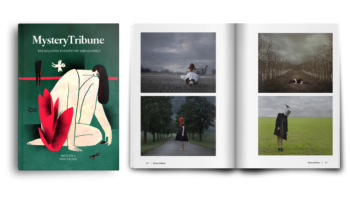 Mystery Tribune publishes its signature blend of reportage, fiction, biography, essays, book reviews, interviews, comics, art and photography four times a year in 240-page volumes. With an eagerness for quality, our collectible print issues are created with premium uncoated paper and beautifully designed for optimal reading experience. 100% of our surveyed print readers keep every single issue they buy and the fact that 94% of our subscribers decide to renew their subscription is a testament to the effectiveness and quality of our magazine. With a powerful niche readership, advertising with Mystery Tribune means that you have access to a sizable group of affluent and educated readers in the U.S. and beyond. ...To an oasis of good writings and perspectives. We are happy to work with you to customize a sponsorship opportunity that includes print and online advertising, promotion on our mobile apps, events, premiums, or other promotional products. Mystery Tribune has developed a specific partnership program for publishers which includes services such as ad design, publishing monthly or weekly professional book reviews, excerpts and interviews, and distributing promotional products. To receive our Media Pack or more information, please contact us at info@mysterytribune.com.